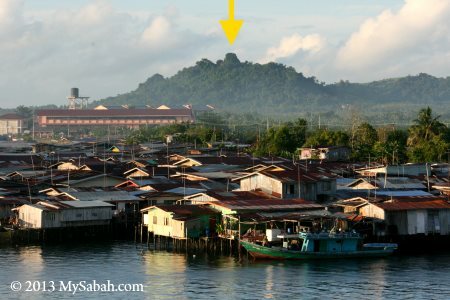 Semporna town is Sabah’s gateway to world-class dive sites such as Sipadan. 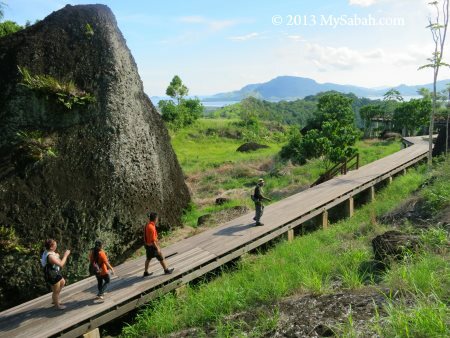 Every year ten of thousand of tourists come to Semporna, but most head straight to the islands and never visit Bukit Tengkorak (literally means Skull Hill), without knowing that they miss an attraction which is an ancient volcanic rim and the largest pottery making site in Southeast Asia during the Neolithic period. 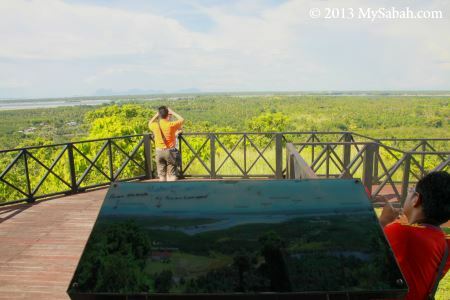 From its top, you also can enjoy a breathtaking view of Semporna and its islands. Bukit Tengkorak is only about 10 Kilometres away from Semporna town and the tour takes less than 2 hours, so I can’t find any reason not to drop by. However, the archaeological museum is new and has no water supply, and the gallery with prehistoric artefacts is not open to public yet (as of Apr 2013). 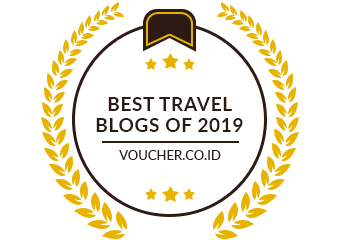 For a better experience, you would need a tour guide who can tell you the interesting features of this place. 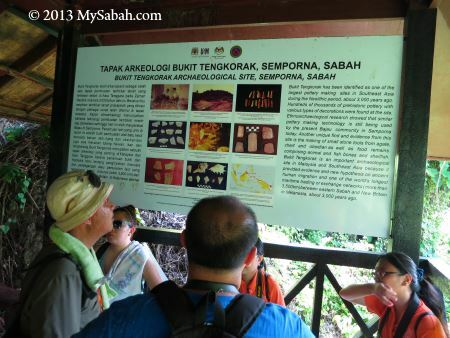 The admission is free, but you need to register before entering the archaeological heritage site. 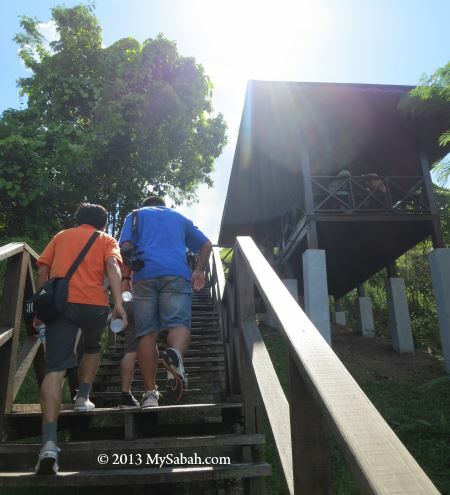 Pic: this is the wooden staircase to reach the top of 500-feet-high Bukit Tengkorak, where the excavation site is located. According to my tour guide, Kenneth, it is exactly 610 steps one way. Sound taxing but I went slow and didn’t feel really tired. There are some hungry mosquitoes around foothill, so please bring your insect repellent. The staircase is in good condition, only a very small part is broken, just watch your steps. As you will walk under hot sun, you may apply sunblock lotion in advance. Bring some water with you, and raincoat, just in case. There are 4 shelters along the way, where you can rest and enjoy the beautiful view. 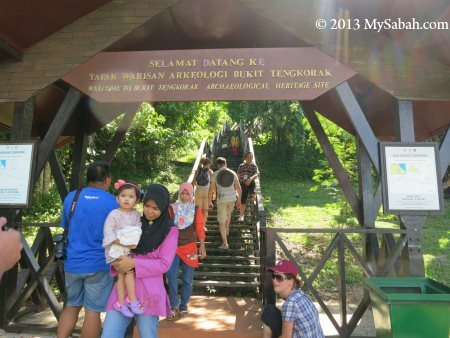 In the shelter, you may read the interpretation board (written in English and Malay) about the history of Bukit Tengkorak. Bukit Tengkorak is one of the largest pottery making sites in Southeast Asia during the Neolithic period (about 3,000 years ago, between 4340 BC and 50 BC). Not only that, research also shows that people traveling between Borneo and New Britain in Melanesia (near Papua New Guinea), which was one of the longest trade routes (3,500 KM) in the world during that period. 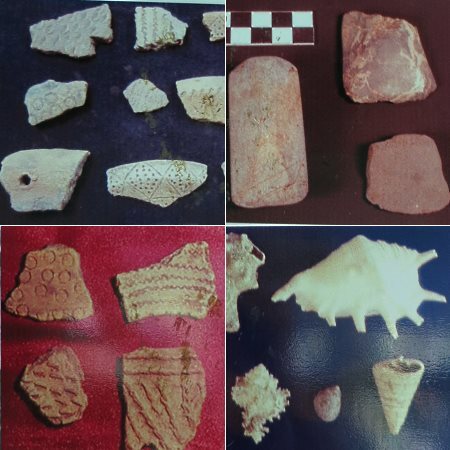 Archaeologists believe such long-distance sea trade and migration route left behind what is known as the Lapita culture of pottery, tools and ornaments. The old pottery manufacturing technology is still being used by the Bajau community in Semporna today. Pic: before reaching the highest point, you already can see Semporna town. Seafest Hotel is clearly visible. Human has existed in Semporna since Paleolithic Period (about 10,000 years ago). 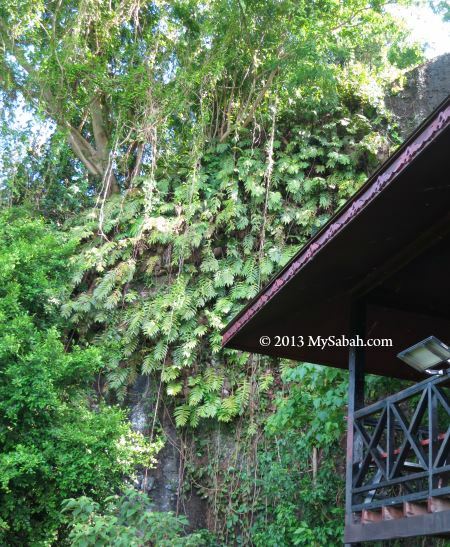 Pic: due to the volcanic soil, the vegetation on this hill is different from other parts of Sabah. Pic: granite embedded in volcanic rock, an interesting geological trait on this hill. 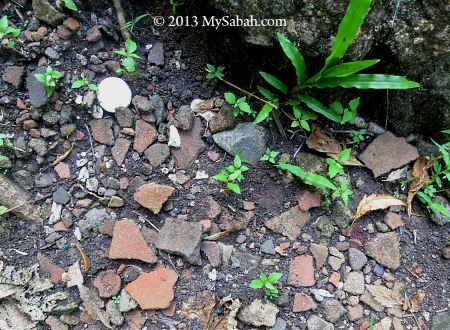 You will find many pottery sherds along the way. It is estimated that more than 6 million prehistoric potsherds can be found all over this hill. 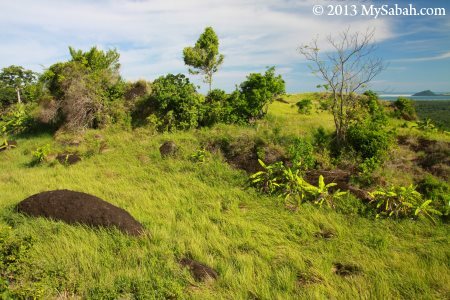 Researchers also find large number of seashells covering Skull Hill. Some says they are washed up to the hill by super Tsunami, some says these are leftover discarded by ancestors. 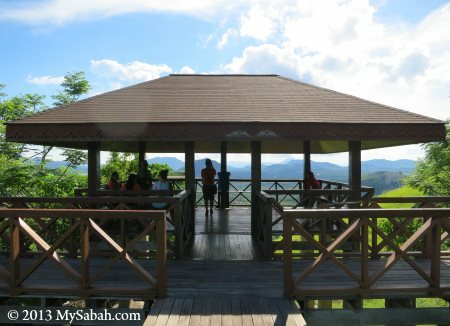 The third shelter has an observatory platform, where you can have a panoramic view of Semporna and its surrounding area. 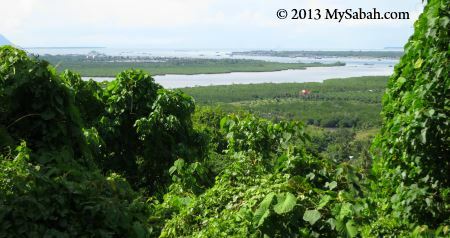 In clear day, you can see Mabul Island. 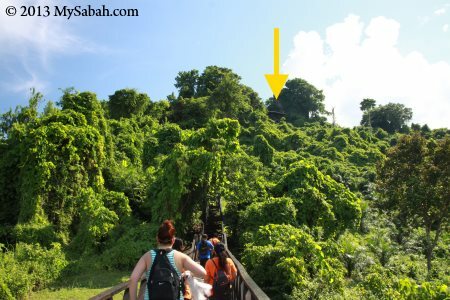 Pic: The “Sleeping Old Man” islands, which is officially known as Semporna Islands Park or Tun Sakaran Marine Park, the largest marine park of Malaysia so far. It is a remnant of a huge volcanic explosion about 5 million years ago. 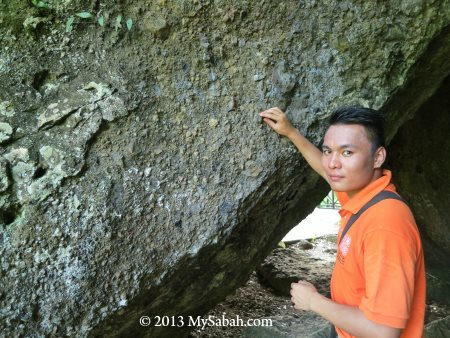 Pic: a huge limestone boulder next to shelter. I could sense that “something” was watching us. Pic: we were moving toward the top. The last half of the hike is under the tree shade, so it is not too bad. 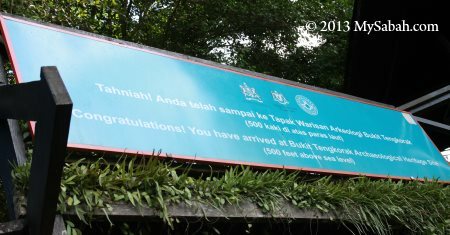 Finally, we were welcome by a congratulatory signboard on the top. Now we are 500 feet (152 Metres) above sea level. It takes only 30 minutes for anyone reasonably fit to get up here. FYI, there is no restaurant and toilet on the hill top. I’m curious why ancestors want to live so high up on the hill. Some says high ground is more secure and this foothill has large clay deposit for making pottery. 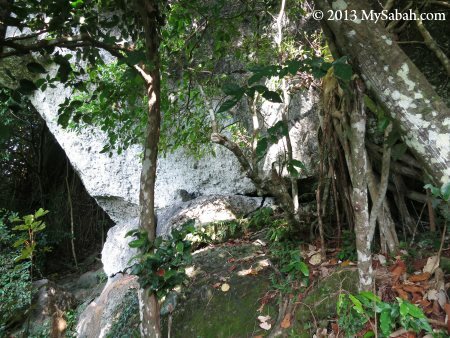 Bukit Tengkorak is an important archaeological site in Southeast Asia because artefacts discovered here supports new hypothesis on ancient human migration. Pic: Historians unearthed thousands of prehistoric pottery with various types of decorations in layers of ash here. This cave was probably a remnant of open kiln for firing pottery. 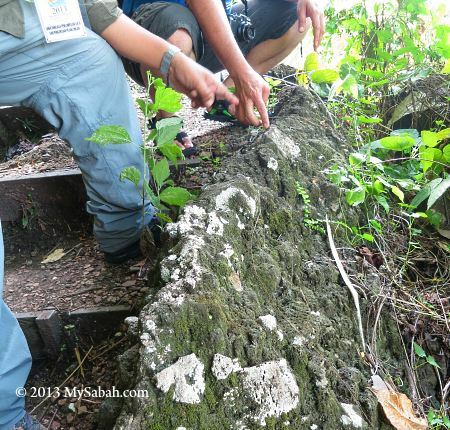 Pic: the items found on Bukit Tengkorak. I snapped these pictures on info board. They say the best pieces were transferred to Sabah Museum. 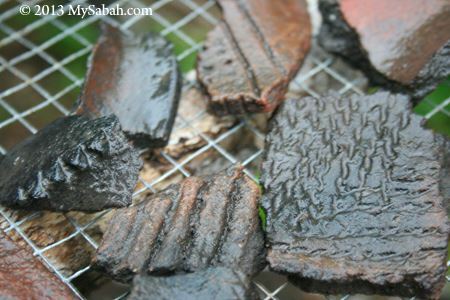 Pic: fragments of decorated pottery made using fingernails, shells and wood materials. Besides hundreds of thousands of pieces of prehistoric pottery decorated with intricate patterns, another unique discovery from this hill is stone tools made of chert, agate and obsidian. Food remains comprising animal and fish bones and shellfish are also found. Ok, let’s close the boring history textbook and let me show you the opposite side of this hill. Now, open the geography textbook LOL. 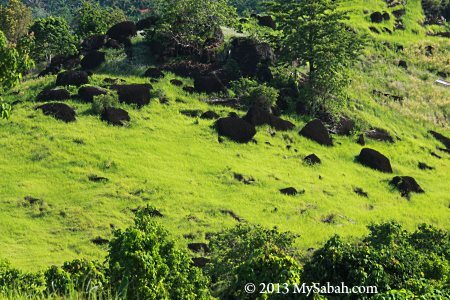 Bukit Tengkorak is actually part of the exposed rim of an ancient volcanic crater about 2 KM in diameter. 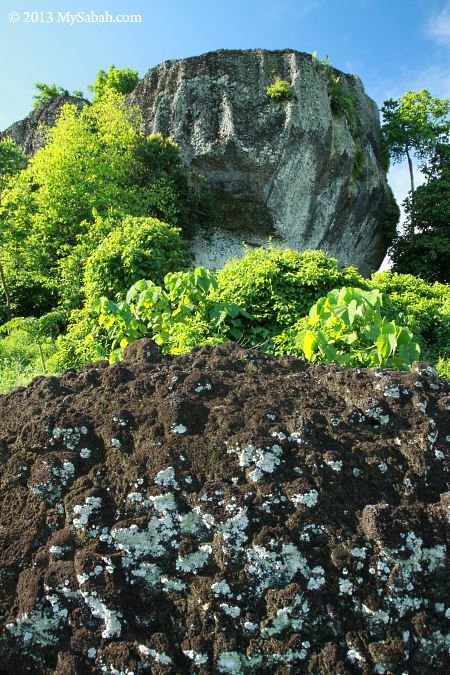 The rock formation at Bukit Tengkorak consists of volcanic breccia, mostly andesitic rocks, and is believed to be the remnants of past volcanic eruptions which occurred during the Pliocene Period (5.3 to 1.8 million years ago). 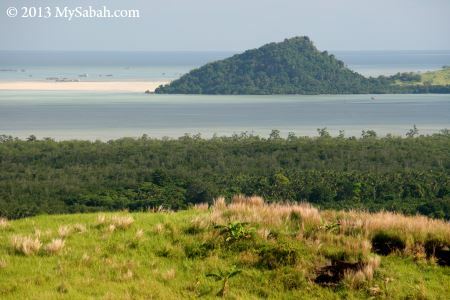 As Bukit Tengkorak is not a popular destination, there were only 9,000 visitors in year 2010. 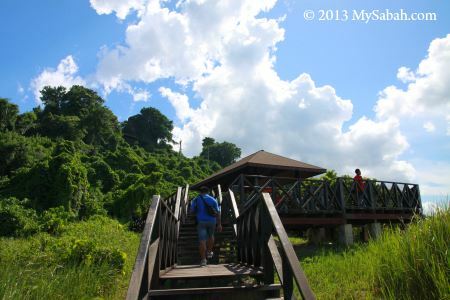 Anyway, because of its nice scenery (and quietness), Bukit Tengkorak has become a hot dating spot of local couples. Our visit may have interrupted a lot of intimate interactions there. Just kidding. This forested hill is covered by grassland and surrounded by numerous isolated hills and mountains. I really love the green view (though the oil palm plantation spoils the view a bit). 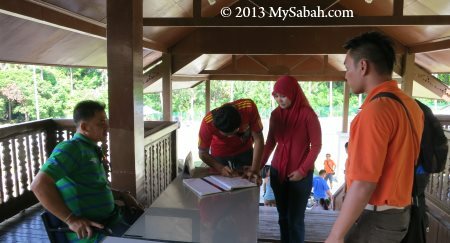 I’ve travelled in most part of Sabah, but this place is so different. 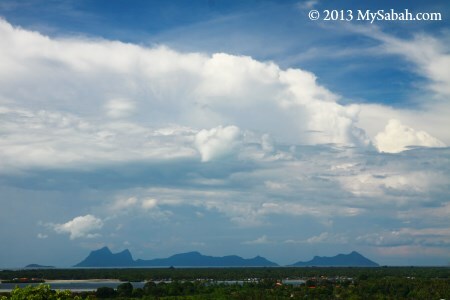 Though I didn’t find any treasure, the picturesque scenes are for me to keep in memory forever. See the ridge dotted by dark boulders at a distance? It is the rim of a huge ancient volcano. 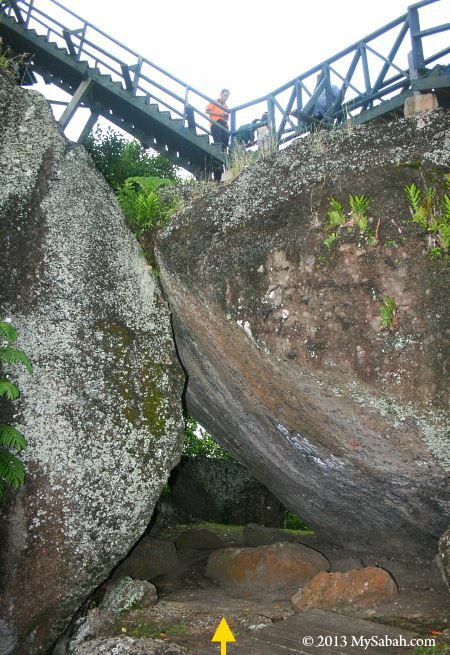 The dark boulders are volcanic rocks which are formed million years ago. 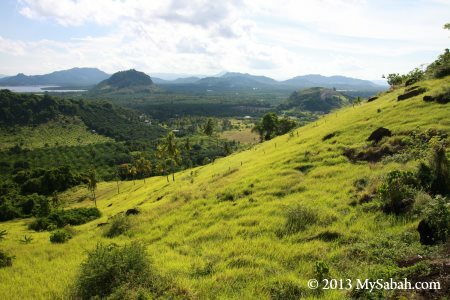 I think geologists would be very interested in Bukit Tengkorak, as they can find volcanic rock, limestone, sandstone and granite in this hill. 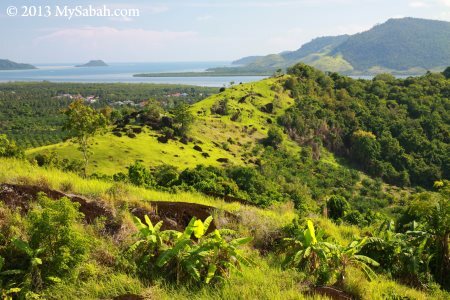 For scuba divers who have enough of Nemo and corals deep underwater at islands of Semporna, a visit to Bukit Tengkorak is a great way to see Semporna high on a hill during long wait of preflight surface interval. For bird watchers, you have a good chance to spot Hooded Pitta. 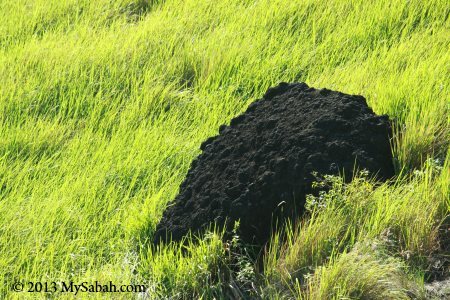 Bukit Tengkorak is located at Jalan Tampi-Tampi (Tampi-Tampi Road), only 10 minutes drive away from Semporna town. When you approach SMK Agama Tun Sakaran school, look for the wooden arch next to the road. Just turn to that junction and you will reach the site in a few minutes (See location map). 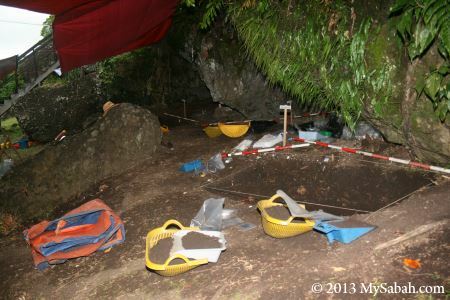 Correspondence Address: Bukit Tengkorak Archaeological Site, C/O Muzium Wilayah Pantai Timur, 2nd Floor, Wisma Warisan, 90000 Sandakan, Sabah, Malaysia.